“Married in month of roses – June- Life will be one long honeymoon”. The month of June, and the mind meanders towards thoughts of summer; to exotic holidays, to chaotic family day trips, and frequently to weddings, and all that they entail. I recently had the pleasure of perusing the pages of ‘Every Woman’s Encyclopedia’, c. 1912, a magazine very much of its time, when many considered that a woman’s place was in the home and her abiding concerns and interests were all things domestic. The articles within this volume are overflowing with information on, amongst other things, home furnishings, table decorations, cookery, embroidery, fashion, children, and last but certainly not least, marriage. 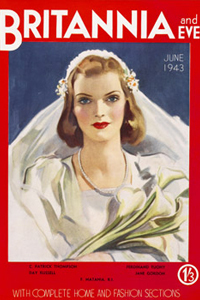 The magazine contemplates all aspects of the lead up to matrimony, but principally focuses on wedding tradition and lore, which seemed an interesting subject for a blog. The magazine is a wealth of information on how one can actively enhance one’s chances of a successful marriage, divulging all manner of scenarios which should either be sincerely welcomed or avoided at all costs by the bride-to be. Who knew that if the bride came across a spider in the folds of her wedding gown she would never lack for money, or that if she was awoken by a robin on the morning of her wedding, or saw swallows come to the eaves for the first time on the big day, she would be eternally blessed? It was considered good practice for the bride to step over the Church threshold with her right foot to safeguard her future happiness. Any jewellery could be worn except for pearls- which symbolise tears- and the wedding ring must not have been tried on prior to the ceremony. Orange blossom was a popular flower at weddings and had, since the time of the Crusades, been regarded as an emblem of prosperity (owing to the fact that in the East, the orange tree bears ripe fruit and blossoms simultaneously); the flower being white was also regarded as symbolic of innocence and chastity. With regards to when to marry, June has always been considered the month for weddings, and Roman maidens preferred it to any other, because it was the name month of Juno, the goddess who took love matters, and all feminine interests especially, under her protection. There is a paragraph on when not to marry too, which marks out May as the worst month of all: “So ancient is the dislike to May marriages that Ovid refers to it as the evil month of May”. The church forbade weddings between Rogation and Whit Sunday, pious and nervous folk originating the familiar adage, “Marry in May, and you’ll rue the day”. It was also considered indecorous to marry on a Sunday, the day of worship, and in England the prejudice against a Friday marriage may be traced to Good Friday, a most sorrowful and unfortunate day. And finally, spare a thought for those intending to marry in April, who would have had to live with the following ‘poetic’ line haunting them forever more: “An April bride will be inconstant, not very intelligent, but fairly good-looking”. Charming. A few other bizarre rituals explored include the drawing of a piece of wedding cake through a ring (preferably a wedding ring) and placing it under the pillow three nights in succession, and the inquirer would then be rewarded by a vision of their future spouse. If no one appeared in their dream, they would need to resign themselves to life as a singleton. There was also an unusual custom in connection with the youngest daughter, which decreed that all her elder sisters must dance at her wedding without shoes in order to counteract the bad luck which would otherwise befall them if they married in “wrong order” of age. Another custom recounted was the throwing of a plate (full of bride-cake crumbs) down from an upper window as the bride alights from her carriage. If the plate reaches the ground unbroken, it was an unfavourable omen, but if it shattered in pieces (the more the better) good luck was sure to attend her. The colour of one’s wedding attire was also under considerable scrutiny. Wearing red was frowned upon at this time, “Married in red, you will wish yourself dead”, whilst the traditional colour of white was very much the favourite, “Married in white, you’ll be alright”, though in fact, frugality meant that many brides would simply marry in their Sunday best frock. It was Queen Victoria’s unusual choice of a white lace gown for her marriage to Prince Albert in 1839 that was to set a trend among Western brides that continues to this day. The familiar saying, “Something old, something new, something borrowed, something blue” is also mentioned and an explanation is given for each line: something old in order to retain the love and affection that was the bride’s in her old life; something new, for success in her new life; something borrowed so that friends may ever be helpful and faithful, and something blue, an emblem of loyalty and constancy. It was considered unlucky for the bride to break anything on her wedding day; such an unfortunate act would almost certainly lead to a lifetime of discord with her in-laws. The magazine also underlines the importance of feeding one’s cat on the wedding day (should the bride have one of course); in addition, one must not read the marriage service prior to the wedding taking place, and if the bridal party should encounter a pig (or several) en route to the Church, they must turn back with immediate effect and begin their journey again. On marriage etiquette and protocol, the magazine is also a rich source of information. When relating details of the man’s proposal, it suggests that for some, writing a note may be the best option, “When courage to speak is utterly lacking, a proposal by letter is a good way out of the difficulty. Even though much note-paper and brainwork may be wasted on the document, at least it may be counted on to do the business; and after several failures to manage it by speech, there is consolation in this reflection.” The female recipient of the proposal is given the following words of wisdom, “A girl does not wish to appear too ready with her “Yes”. She thinks that this may cheapen her in the eyes of the person whom she would like to value her more highly than anyone else in the world”. Focus then turns to the wedding itself. The bridal bouquet should be small and elegant as “the huge bouquet with which brides in the end of last and the beginning of the present century were burdened was not at all a graceful adjunct, for several reasons. Its bulk obscured the outline of the figure. It interfered with the pretty folds of the wedding veil. It hid the front of the gown, often very charmingly trimmed with lace or embroidery, and its weight tired the arm of the bride, already quite tired enough with the arduous work of the previous weeks in connection with the trousseau, the correspondence with regards to presents, and other preparations”. The bride-to-be is offered advice on the cutting of the wedding cake, which at this time, was the sole duty of the woman: “There is occasionally a little difficulty in cutting through the sugar icing, but the bride should not let anyone help in her task. A straight, downward thrust, the knife held perpendicularly, will manage the business and the rest is easy”. The tossing of the bouquet, very familiar to us all, was already firmly entrenched in bridal ritual at this time: “The bride must not forget to distribute sprays of her bouquet among her bridesmaids and other girl friends. There is an idea that this may lead to other weddings”. It goes on to describe how the bride must toss the bouquet high above the heads of wedding guests and the one who caught hold of it was destined to marry within the year. Amusingly, the best man’s prime duty is as follows: “If his friend should be nervous in anticipation of the coming ordeal, it is the business of the best man to inspire him with courage and to infuse into him that spirit of resignation which is his best armour against tribulation”. In summary, if you had been hoping to get married in 1912, you would be wise to avoid marrying on a Friday or Sunday, especially in May; best not to wear red, and a good idea to keep one’s head down on the journey to Church so as not to chance upon a pig! The final paragraph on wedding lore in this volume concludes very eloquently indeed and is a fitting end to this blog: “Let the cynics and pessimists sneer and declare what they will, they will never convince the world that Love is not the light of life, its crown and completion, and God’s highest gift to man”. A vivid and eclectic lightbox of wedding imagery from our archive can be viewed here. ‘The Life Guardsman Who Dropped It’, published in The Tatler Christmas Number, 1935. It’s the Epsom Derby this weekend, one of the highlights of what was once widely known as ‘the Season’ – a round of social events beginning with the Summer exhibition private view at the beginning of May and ending with Cowes Week in early August. Many of the key events of the Season still remain of course; the Derby, Ascot, Wimbledon, Henley, but equally plenty of traditions have disappeared. Court presentations, when the daughters of the upper classes made their curtsey to the King and Queen, were stopped by the Palace in 1958. The famous clubs like Ranelagh, where society flocked to enjoy polo, gymkhanas and tea on the lawn disappeared long ago, and the whirligig of parties, balls and cocktail parties that any self-respecting debutante would stoically endure have been replaced these days by music festivals and roof bars – open to all and not just the privileged few. Nevertheless, though a shadow of its former self, the Season remains a sort of mythical blueprint for the quintessential British summer. A quintessential British cartoonist was H.M. Bateman (1887-1970), whose cartoons poking fun at polite society were to make him a household name. 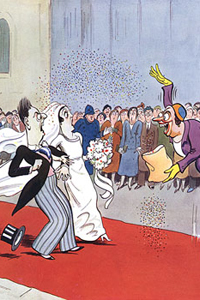 Bateman contributed to many magazines during his long career, including Punch and The Strand (both held here at Mary Evans) but is most closely associated with The Tatler, who published hundreds of his cartoons during the 1920s and 30s. Many of them were prefixed with ‘The Man Who…’ and portrayed all kinds of nerve-shredding, toe-curling social faux pas, much to the delight of its readers who, in a typically self-deprecating English fashion, rather liked Bateman’s acerbic take on the pettiness and pedantry of their privileged world. H.M. Bateman’s style, using quick-fire, efficient line, and frequently bold colour, instilled a frenetic movement in his characters and firmly equated appearance with feelings. Thus the wretched chap who dares to wear a bowler hat in the Royal Enclosure at Ascot visibly shrinks in the looming presence of those correctly attired in top hats and tails. Blustering colonels go puce with incandescent rage, quivering men go green with fear of their imperious mother-in-laws. And the shock of one small Etonian, who is aghast to see his parents arrive in a charabanc for the Fourth of June celebrations, is only magnified by the disdainful and snobbish profiles of his fellow pupils. Who better to portray the London Season? We give you here, ten of Bateman’s best cartoons on the subject. They may parody the posh crowd but form a peculiarly appropriate celebration of the London Season. ‘The Horse that Took the Wrong Turning at Epsom’, published in The Tatler, 6 June 1933. ‘The Outrage – or Someone Throws Confetti at a Society Wedding’, published in The Tatler, 21 June 1933. June is of course, the wedding season. Bateman’s wedding sees a bride, groom, guests and assembled spectators look on in shock as one lady does something that can only be described as vulgar – she throws confetti. ‘Light Refreshments – The Private View’, published in The Sketch, 1 July 1914. The opening of the summer exhibition at Burlington House was the starting pistol for the summer season though visiting other art exhibitions would be one of the many sources of amusements for those doing the Season. This Bateman cartoon is taken from The Sketch in 1914, so earlier than others (and hence in black & white). Bateman brilliant conveys the silent, isolated fury of an artist who discovers guests at his exhibition are shamelessly more interested in the canapés. ‘The Parents Who Came by Charabanc’ published in The Tatler, 31 May 1933. ‘My Hat! The Winner, Ascot’ published in The Illustrated Sporting & Dramatic News, 16 June 1928. ‘The Dirt Track Rider Who Appeared in Rotten Row’ published in The Tatler, Christmas Number, 1929. Rotten Row in Hyde Park has traditionally been the place to see and be seen, particularly on horseback. ‘The Debutante’ from The Tatler, 30 June 1926 – combining two bastions of the social season, Wimbledon – and the debutante (with all eyes upon her). ‘Discovery of a Dandelion on Centre Court’, The Tatler, 24 June 1925. Bateman here reflecting the peculiarly British obsession with grassy perfection. ‘The Unwelcome Guest’, The Tatler, 24 July 1929. We particularly like that this yacht’s captain has been reading The Tatler! As custodians of the Illustrated London News archive, containing The Bystander, The Sketch, The Tatler and The Illustrated Sporting & Dramatic News (all of which Bateman contributed to), we have one of the biggest collections of H. M. Bateman cartoons, and it’s growing all the time. To see a wider selection click here.